Ethan Renner (Kevin Costner from “Man of Steel“) has been a CIA agent for 25 years, but now he is dying from some kind of “brain cloud.” He decides it’s time to return to Paris and make amends with his estranged wife and 17-year old daughter Zoey (Hailee Steinfeld from “Ender’s Game“). Just imagine the gasp in the theater when we find out the CIA has asked him to do just ONE MORE JOB. Like we’ve never seen this before. Leading our dying hero back into the fray is the blonde bombshell Vivi (Amber Heard from “Paranoia”) who is “top shelf” (what she calls herself) and throws herself at him like a drunken prom queen. This whole movie seemed like a spoof of the genre with names like, “The Albino,” The Accountant,” and “The Wolf.” At least Costner did not say he was “getting too old for this,” though at 59 somebody needs to tell him that. Now, I really like Costner, but in this movie he had to keep his heart rate low. I think they made it part of the plot because it matches his acting style. Everything he did seemed to annoy him, whether it was a family dinner or shooting three guys on the street. The movie is meant to be a plot-driven thriller played against sentimental family moments. These two elements did not mix well here, and the result just seemed tired and hack. This kind of thing has been done well in “The Long Kiss Goodnight,” and Luc Besson actually did it in “Leon: The Professional.” In this movie, everything just fell into place way too perfectly, and when that happens it is not thrilling. 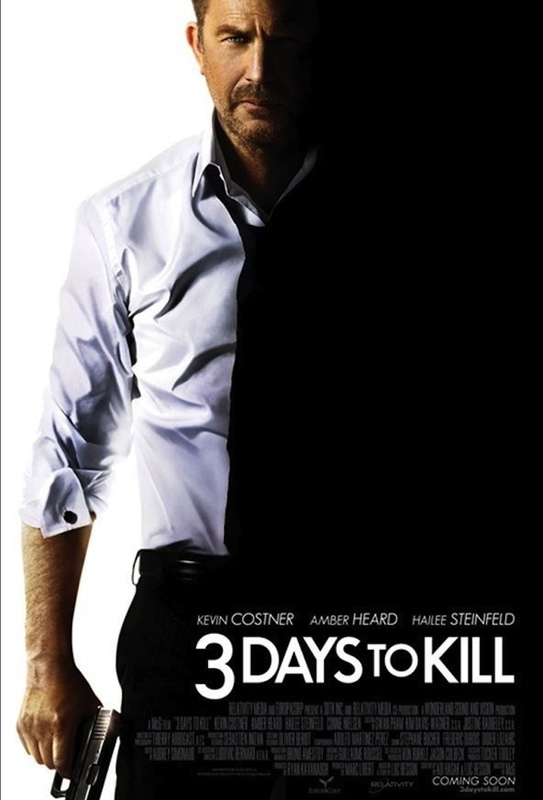 I can only give this movie 1 star out of 5, and that is because of Costner’s badass biker scene. 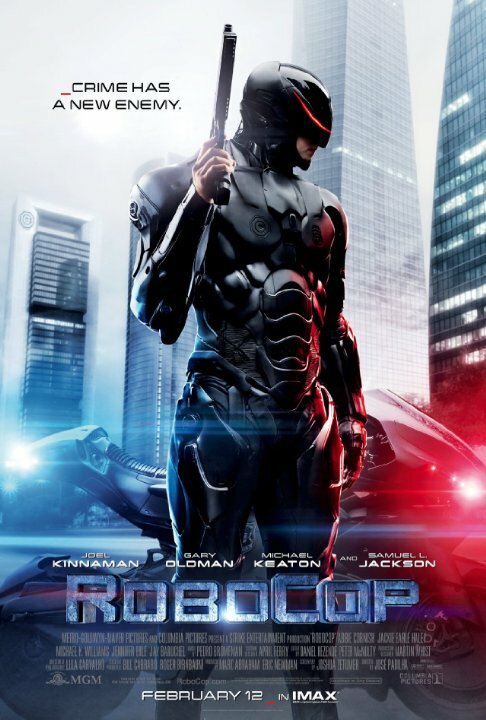 The rest of it should only be seen on cable at 3 a.m.
Today I am ashamed to admit I saw “RoboCop,” the 2014 model with all the fancy upgrades. Not to be confused with Paul Verhoeven’s “Robocop” from 1987 that came out at the same time as Windows 2.0 and worked just about as well. In this reboot, we find Officer Alex Murphy (Joel Kinnaman from “Safe House”) trying to get illegal guns off the street of his beloved Detroit. He is shocked to find some corrupt cops right in his own department. I could make a reference to Bogart and “Casablanca” here, but only my daughters would get it. In 2028, the setting for this futuristic farce, OmniCorp has developed incredible robot cops that are deployed all over the world, keeping law and order. However, they are forbidden for use in the United States, until the evil corporate giant can put a better “face” on it – Alex’s face. I did see the rest of the movie, and the robotic plot did not surprise me for a nanosecond. This movie spends most of its time on the technology and special effects and not enough on the people or the theme of the movie. There is a nod here and there to society’s preference for safety over liberty, and that all these problems can be solved with a better toaster – I mean robot. There was little of the fun or humanity of the ’87 edition in this update. With a hip “Iron Man” in today’s world, the whole thing seemed tired and rundown. I sure hope they pull the plug before they make any sequels. Oh, and if you can find a worse Michael Keaton role or performance I will mow your lawn. The only thing half interesting was Samuel L. Jackson (“The Avengers”) as Pat Novak, the right-wing nut pushing the country toward complete robot automation of the police force. The scary thing is that he has hair in this movie and looks exactly like Al Sharpton. For that, I give this movie 1 star out of 5, and I recommend you take the large popcorn for three dollars more so you don’t end up on a list. 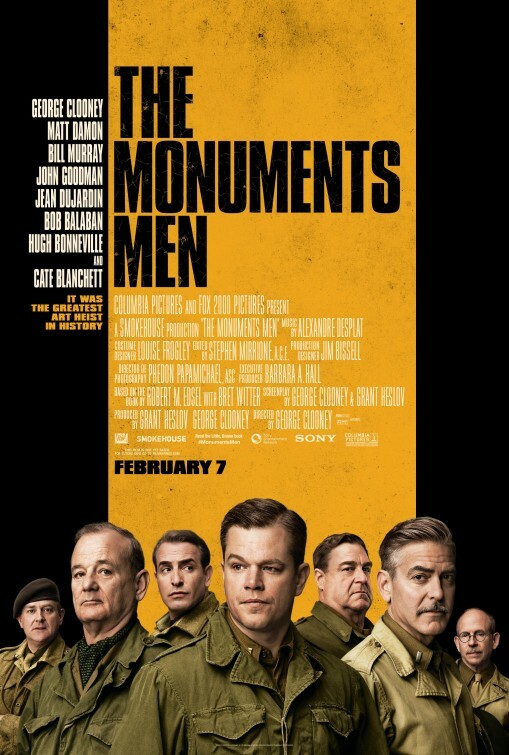 “The Monuments Men” takes the historic story of Nazis stolen artwork off its pedestal and brings it to a theater near you. The movie is based on the book by Robert M. Edsal, which tells the true story of how Adolf Hitler stole most of the important European art and hid it for his private collection. Seems it was not enough for him to take their countries and their lives; he had to take everything they held sacred. Those who can’t paint art must steal it and try to dominate the world. Director/Writer/Actor George Clooney (“The Ides of March”) stars as Frank Stokes, who sets out on a mission to find these great works of art and return them to their rightful owners. He puts together his crew of six men, starting with James Granger (Matt Damon from “Elysium”). I could tell they were going for some kind of “Magnificent Seven” thing here, and they almost pulled it off. You can’t go wrong with John Goodman (“Inside Llewyn Davis”) and Bill Murray (“Moonrise Kingdom”) on your team – and in your movie. These guys may be too old to fight but are still at the top of their game. The more character that their faces develop over time just makes them better character actors. It’s not a complete sausage fest, as Cate Blanchett (“Blue Jasmine”) plays Claire, the French babe who helps them find the art. If she told me, “You bring the potted meat and I will bring the wine,” I would be there. This is a cool story, an important story, but one that played more like a documentary or re-creation than a compelling movie. Clooney kept the mood light with many small comedic and character bits with the war as a mere backdrop. I like Clooney, in front of and behind the camera, but he was not able to pull off the same magic as Billy Wilder did in “Stalag 17”. Clooney’s team of merry men seemed to float through this movie and the war like, well, like they were making a movie about it. Sure, a couple of them did not make it back, as if to only prove the price for their lives was priceless art. This is an enjoyable movie, with some great actors and beautiful set pieces, but I never felt like these boys were really at war. This may be way it all happened, but they are selling this as an action movie. The true story may be a great thing, but this is not a great movie. For that reason, I must give it 3 stars out of 5, as standard movie faire. I expected more from this exceptional cast.